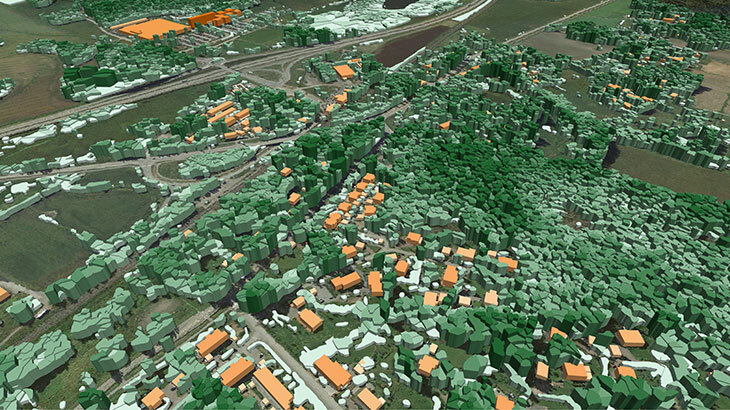 Jorvas (Finland) 3D Dataset was produced as a demo map package for accurate planning of 5G networks and IoT services. The dataset used for radio wave signal simulation in mm-wave 3.5 GHz band rural scenario while 5G and 3D network planning using Visicom highly accurate 3D Trees model (3d Canopy model). 3D geodata package for 5G rural Planning contains: Digital Terrain Model (DTM), Digital Surface Model (DSM), highly accurate 3D Buildings with roof details, 3D Trees Model (3D Canopy Model), Clutter/Land Use/Land Cover Model, Obstacles Heights (Clutter Heights) Model, Vector model, Transportation networks etc. 3D geodata package for IoT could be customized in any representation. The main data layers are 3d low-poly building footprints with assigned attributes of heights, vector vegetation up to alone standing trees with heights, detailed road network, engineering constructions as vectors (namely, bridges, overpasses etc). Download the brochure and free data sample of 3D rural map tailored for 5G planning for more details. Our geodata catalogue includes over 5000 cities across 120+ countries.